Eighteen ill-housed families appear lined up on the back row of the Council Chambers. 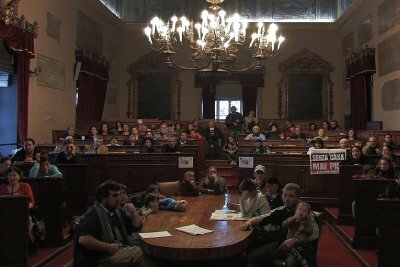 They decide to occupy Palermo town hall. Democracy incarnate seems to take hold of the woodwork and the gilt. Dreams of victory and decent housing drive the squatters. A young “mediator” Fabrizio, a left-wing councillor tries to represent them. Then little by little the Palace becomes a venue for conflict. Self-interest emerges. The public space is privatised. The first occupants guard their territory against newcomers. Their claims meet political realities and red tape.